Our Sporting Clays choke tubes are made from 17-4 heat-treated stainless steel and precision machined to produce a choke tube that patterns better than standard choke tubes. These choke tubes feature a 25% longer parallel section in the choke thus throwing more consistent patterns than conventional choke tubes. Extended choke tubes protect the end of your barrels and have knurling on the end to allow for quick and easy removal. 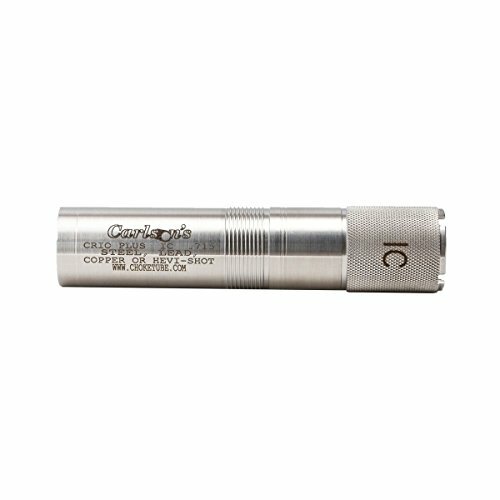 Each choke tube has the constriction laser marked on the end for easy reference. Lead, Copperplate, Nickel, Have-Shot, Bismuth, Tungsten or Steel Shot may be used in these choke tubes. Steel shot larger than BB should not be used in any Sporting Clays Choke Tube tighter than Full Constriction. Our Sporting Clays Choke Tubes will throw tighter/denser patterns than Flush Mount Choke Tubes due to a longer parallel section. These choke tubes are backed by our Lifetime Warranty. If you have any questions about this product by Carlson's Choke Tubes, contact us by completing and submitting the form below. If you are looking for a specif part number, please include it with your message.